Apparently, he had that much muck on his hands they looked like eight ounce boxing gloves. Sudocrem is quite handy though. I have used it since the twins were born. But I must say as they were very premature, I was told not to try and keep everything sterile, we need to build our own immune systems to germs. Mags, I remember Germolene in a round beige/cream tin! My mother used to swear by it. l thought it was miraculous in the way it soothed your cut or graze and it got better so quickly. 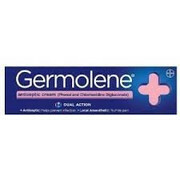 I can’t remember the tins of Germolene, Art but I do know it seems to heal cuts and grazes a lot quicker than other creams. I bet you had an Apple a Day aswell. Calamine and glycerine cream (in a tube) is one of the best things I have found for quickly healing minor wounds and sore areas. A bit messy, but cheap as chips.